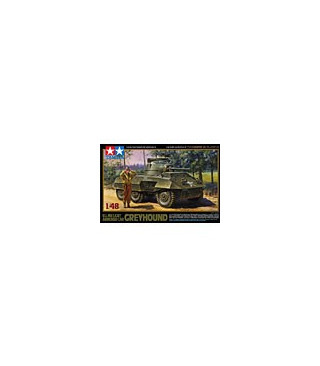 * 1/48 scale assembly kit of the U.S. M8 Light Armored Car Greyhound. * A number of pre-sculpted parts help recreate the complex suspension system while keeping the number of parts down for ease of assembly. * Open top turret allows viewing of internal details such as the main gun breech. * Parts of the chassis are made from die-cast metal, giving the model a realistic sense of volume. * 1 figure and 2 sets of markings are included. * Perfect for posing together with other 1/48 U.S. AFVs and figure sets.